Here are the publications that the Harrison County Historical Society has available to purchase at this time. Stay tuned for more books in the near future. You can purchase these books from our office and we can shipped for a fee. Or though the Amazon links below. Click Here To Purchase "Sketches"
25 researched topics primarily by Dorothy Belle Davis and contribution by Dr. Robert Wilson on Harrison County West Virginia. Topics covered including articles on John J Davis, Gypsy West Virginia, West Milford Civil War militia, Jackson Pearson Duel, Salem College, William Henry Harrison Campaign, George Washington's Sword, the Randolph Academy, the Waldomore, early road construction and more. Included are all original footnotes and reference material. Click here to purchase "Other Days"
​Other Days is a collection of articles pertaining to the earlier history of Shinnston and Pine Bluff, areas settled by the Shinn and other families. This book was originally published in 1978, on the 200th anniversary of the establishment of the Shinn settlement. Click here to purchase "Ramblings"
​Jack Sandy Anderson's first book was published c. 1960. In it he details life in the community of Pine Bluff in Harrison County. Local history and people are his subject matter. At the end of his little book we have added comments from Jack on his school days and notes from people who knew him. Click Here To Purchase "Out of the Past"
"Out of The Past" is a collection of articles devoted to Harrison County WV history written by Jack Sandy Anderson, well-known historian and past president of the Harrison County Historical Society. Articles included: the Civil War, coal industry, World War II, Shinnston Tornado, Melville Davisson Post, Granville Davisson Hall, physicians and hospitals, O'Dell's Knob, Stonewall Jackson's parents, John and Rachel McIntire, Thomas and Edward Cunningham, early Hornor family, etc. Click Here to purchase "Glimpses of the past"
​Jack Sandy Anderson wrote articles for many years for publication in newspapers and books. He wrote on topics including both Harrison and Marion County West Virginia. This collection represents some of his favorite articles on Marion County, WV. Included are sketches of four West Virginia Governors with ties to Fairmont, Gov. Aretas Brooks Fleming, Gov. Francis Harrison Pierpont, Gov. Matthew Mansfield Neely, and Gov. Ephraim Franklin Morgan. Altogether there are 35 articles on people, places and organizations. One of the more unusual articles concerns Peter Crowe, an enigmatic log ago character from the Bingamon area who possessed amazing abilities. Click here to purchase "Shinnston tornado"
​John L. Finlayson collected and published photos and personal accounts of the people who lived through and responded to what became known as the Shinnston Tornado. This scarce book is now being republished. The storm system that created the tornado outbreak remained one of the most devastating storms in our nation's history for many decades. Click here to purchase "Old gold"
the interests of the local history of Harrison County, WV. Granville Davisson Hall wrote about his boyhood years in later life. He grew up in small town Shinnston, WV in the years prior to the Civil War. Our editions identifies the real personalities and places that he disguised in his work. Included are pictures of structures he would have been familiar with, some still standing. Written in 1838, Ms. Jane Despard points her acid pen at the lives of her family members living in Ireland for the previous 250 years. Jane herself is very well educated, has a sterling intellect and uses it to devastating effect on her ancestors and peers. Her social outlook is strictly upper middle class English and she is very concerned about social standing, income, “improving property.” and morality. She can be very engaging and has a dry, droll wit. A self-proclaimed heretic, she does not pull her punches. Everyone gets the full magnifying glass treatment of her intellect; from “Infidel Geologists” to “cross grained” cousins as well as various idle and dissipated relatives, no one is spared except a few saintly individuals and even they get a few barbs. She also recites aphorisms, sayings and turns of speech that you just won’t see anywhere else. Click here To purchase "Long Delayed Wedding Journey"
A recreation of W.C. Clark and Nevada Clark's original work from their delayed honeymoon journey taken in a Flivver (Model T Ford) in 1922. This journey was taken during the beginning of the automobile age and roads were just being built and surfaced in rural towns. Their journey describes the sights, scenery and people they met along the way. Added content includes town history and obituaries of the principal authors. 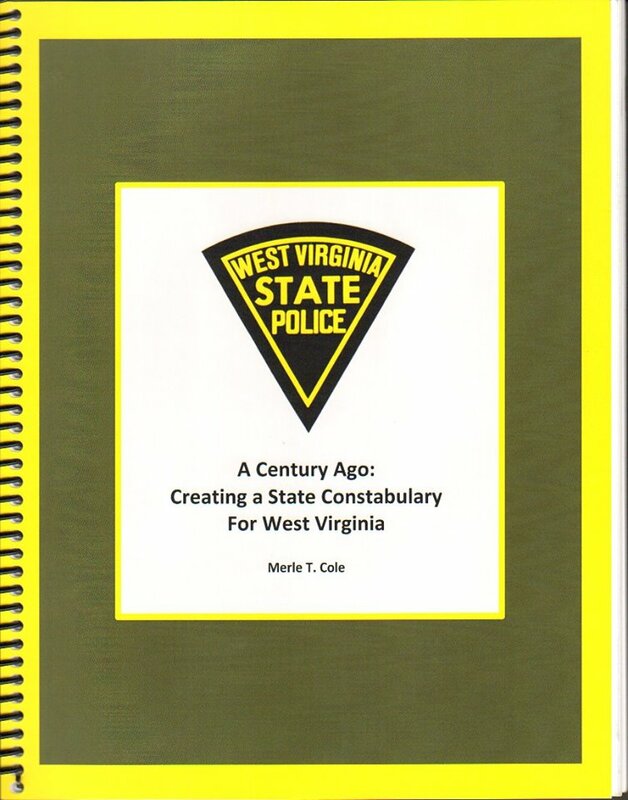 A history of the first 20 years of the West Virginia State Police, on the occasion of its centenary 1919. The 110-page book features pictures from the State Police Academy and Eastern Regional Coal Archives. All profits of this book go toward the West Virginia State Police 100th Anniversary Fund.